How to fine-tune your resume so it performs like a well-oiled machine. As you embark on your engineering career, you'll need a resume that makes you stand out from the competition, says resume expert Kim Isaacs. 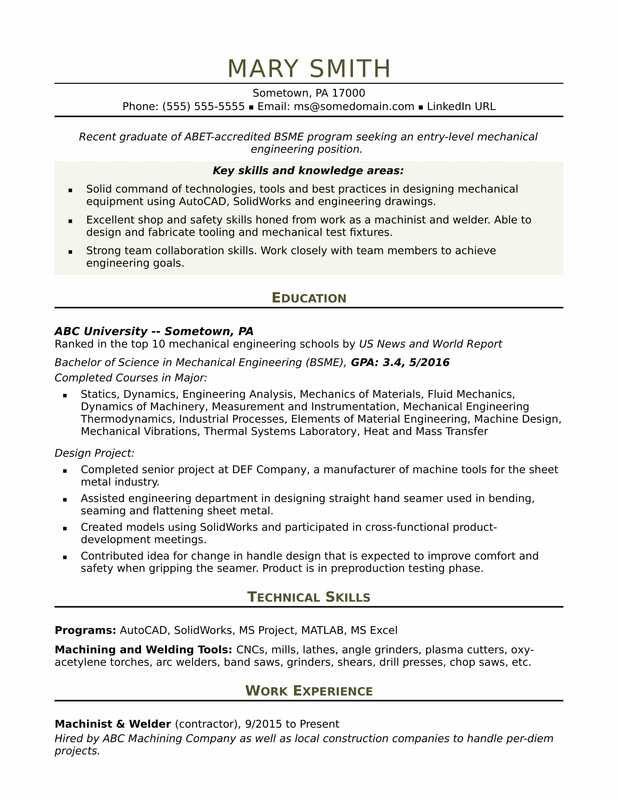 For ideas on how you can fine-tune your own resume, view this sample resume for an entry-level mechanical engineer that Isaacs created below, and download the entry-level mechanical engineer resume template in Word. Jobs for mechanical engineers are projected to grow by 9% (or 25,300 jobs) from 2016 through 2026, according to the Bureau of Labor Statistics (BLS). You’ll find the highest level of employment for this job in the following states: Michigan, California, Texas, Illinois, and Ohio; and in the following metropolitan areas: Warren, Michigan; Detroit, Chicago, Houston, and Los Angeles. As a customer service rep, you can expect to make a median wage of $85,800 per year, or $41.29 per hour, according to the BLS. Additionally, you can learn more about engineering careers on Monster. Recent graduate of ABET-accredited BSME program seeking an entry-level mechanical engineering position. Solid command of technologies, tools and best practices in designing mechanical equipment using AutoCAD, SolidWorks and engineering drawings. Excellent shop and safety skills honed from work as a machinist and welder. Able to design and fabricate tooling and mechanical test fixtures. Completed senior project at DEF Company, a manufacturer of machine tools for the sheet metal industry. Assisted engineering department in designing straight hand seamer used in bending, seaming and flattening sheet metal. Created models using SolidWorks and participated in cross-functional product-development meetings. Contributed idea for change in handle design that is expected to improve comfort and safety when gripping the seamer. Product is currently in preproduction testing phase. Machining and Welding Tools: CNCs, mills, lathes, angle grinders, plasma cutters, oxy-acetylene torches, arc welders, band saws, grinders, shears, drill presses, chop saws, etc. Hired by ABC Machining Company as well as local construction companies to handle per-diem projects. Earned a reputation as a talented machinist and welder. Developed excellent fabrication and machine shop skills, completing all projects on time and to specifications. Handled welding assignments that involved installing, repairing and fabricating materials (sheet metal, steel, tools, parts, doors, gates and more). Became adept at reading blueprints/drawings and fulfilling work orders. Demonstrated advanced skills in operating equipment and machines including CNC machines, cutting machines and hydraulic presses for the fabrication of mechanical components. As a mechanical engineer, you're familiar with complex machinery held together by the simplest of parts. Think of your resume the same way. Could you use some help fine-tuning the details? Get a free resume evaluation today from the experts at Monster's Resume Writing Service. You'll get detailed feedback in two business days, including a review of your resume's appearance and content, and a prediction of a recruiter's first impression. It's a quick and easy way to get your career in gear.